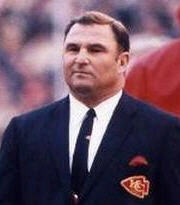 Hall of Fame coach Hank Stram, who took the Kansas City Chiefs to two Super Bowls and was known for his inventive game plans and exuberance on the sideline, died on July 4, 2005. He was 82. Stram had been in declining health for several years and Dale Stram attributed his father’s death to complications from diabetes. He died at St. Tammany Parish Hospital, near his home in Covington, across Lake Pontchartrain from New Orleans. He built a home there during his two-year stint as coach of the Saints and retired there. “Pro football has lost one of its most innovative and creative coaches and one of its most innovative and creative personalities as well,” Chiefs owner Lamar Hunt said in a telephone interview. Stram was the Chiefs’ first and winningest coach. He took over the expansion Dallas Texans of the upstart AFL in 1960 and coached them through 1974, moving them to Kansas City where they were renamed the Chiefs in 1963. The gregarious, stocky, blazer-wearing Stram carried a rolled up game plan in his hand as he paced the sideline. He led the Chiefs to AFL titles in 1962, ’66 and ’69 and to appearances in the first Super Bowl, a 35-10 loss to Green Bay, and the fourth, a 23-7 victory over Minnesota in 1970. He had a 124-76-10 record with the Chiefs and in 17 seasons as a head coach was 131-97-10 in the regular season and 5-3 in the postseason. Stram was credited with the two-tight end offense that provided an extra blocker. He was the first coach to wear a microphone during a Super Bowl and Stram’s sideline antics, captured by NFL films, helped bring the league into the video age. Stram later coached two seasons with the Saints and enjoyed a successful second career in CBS’ television and “Monday Night Football’ radio booths as an analyst. Stram made his mark in the booth by consistently telling the audience what would happen before it did. ”I think they’ll go deep here,” he would tell his partner, Jack Buck. “John just saw what I saw,” Stram would say. Stram was inducted into the Pro Football Hall of Fame in 2003. The then-80-year-old had to be pushed onto the stage in a wheelchair and his induction speech was videotaped. In an interview that year, Stram said he would accept another coaching job in a minute. Len Dawson, the Hall of Fame quarterback who played under Stram at Kansas City, also called him an innovator. “He was responsible for doing a lot of things in the ‘60s that teams are still doing now,” said Dawson, citing the moving pocket and the triple stack defense. Hunt hired Stram, then an assistant at Miami of Florida, in 1959 after Oklahoma’s Bud Wilkinson and then-Giants assistant Tom Landry turned down the team.